Zeltbahn Shelter Quarters, four per sheet. These are images of the SS Plane Tree pattern zeltbahn in green dominant (Summer use) printed on regular paper and are NOT decals. They are one sided only and printed in waterproof ink. 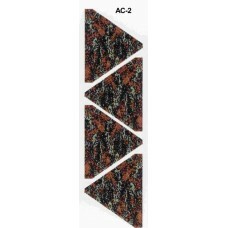 Use them to enhance dioramas or create a zeltbahn shelter using Aleran resin tent, AC-05 or AC-06.